Marley has adapted her father Bob Marley’s famous song into this picture book. The book follows the same arc as the song, but is simplified considerably. Fans of the song will definitely try to sing along with the words since they are so iconic. Children who don’t know the song will discover a vibrant picture book where the words give the emotion, but the pictures tell the story. It’s the story of a community coming together to turn a vacant lot into a park, One Love Park. This simple picture book owes much to the original song. It’s where the book gets its heart. The words are pulled directly from the song and in picture book form read aloud well. Just like the song, the emphasis is on community, love, and creating a new world together. Brantley-Newton’s illustrations add so much joy to this book. They are full of color and movement, the multicultural cast of characters are vibrant and glowing. Readers can also keep an eye out for visual references to Bob Marley. Simple, lovely and powerful, this book is definitely worth celebrating. Appropriate for ages 2-4. This funny book about an overcrowded zoo contains words that are lyrics from the Broadway Show, Do Re Mi. The zoo is so crowded that the animals are stepping on one another. The kangaroo’s pouch is stepped on by a bear. The moose’s snout is stepped on by a goose. All of the animals demand to be let out of the zoo. So when the zookeeper arrives at the door, he is stampeded by all of the animals in their rush to escape. The book combines humor and rhythm into one very appealing read. Comden and Green had a way with words and rhythm. I only wish I could have heard the music for the book and kept checking to see if there was a CD that I had missed. The writing is humorous, offering plenty of laughs for young readers. Much of the humor is also visual in the illustrations by Foster. His art adds an appealing cartoonish, slapstick humor to the read. Children will love the expressions on the faces of the animals as they are trod upon. There are also several large flaps to lift that add even more fun. This one is a treat to read aloud, the rhymes and rhythms flow beautifully. Children will love the animals, the jokes and all of the zany fun. Appropriate for ages 3-5. 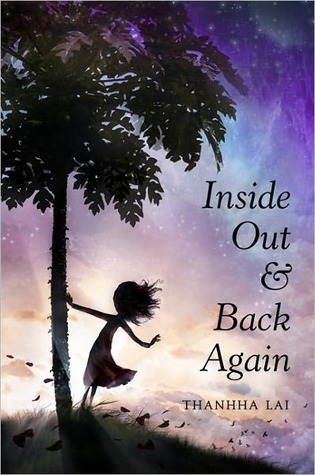 The winner for the Young People’s Literature was Thanhha Lai for Inside Out and Back Again. And here is my enthusiastic review.